In order to decide which version was even worth watching these days I decided to go ahead and undo the very specific contextual assertions of The Directors Cut and the poor grading of The Final Cut, whose technical improvements were shrouded in a fashionably teal fog. - Brian Eno / David Byrne: Qu'ran - audio track. The audio for this edit defaults to the Final Cut (FC) mix, except where previous audio mixes are preferred or dictated by edits to previous cuts. Opening Ladd logo is from the FC and graded to match the Director's Cut (DC). Opening crawl and titles are from DC as the FC titles are larger and poorly rendered with stepping visible in the curves. Deckard Intro and Noodle Scene is from the DC. Audio cuts from and back to the FC seamlessly before any left/right/centre channel dialogue starts. The spinner journey to the police precinct and to the Tyrell building - The cityspeak over the comms has been removed. The center channel has been replaced with the DC version and the external shots for the spinner journeys to the police precinct, to the Tyrell Corporation and to Leon's hotel is footage from the FC & regraded to match the DC. Bryant's over dub about “Skin jobs” has been tweaked to better suit the room's reverb ambience with a little pitch, reverb and EQ. Also added a little reverb to Leon's, Zhora's and Pris' introductions. All shots looking into the sun in Tyrells office are from the FC graded to suit the DC except for Deckard's introduction close up as the posterisation was worse in the FC. The DC footage for these shots generally had very coarse grain/noise. The FC shots were smoother and they also had much more light playing into the stage wings on the wide shots, showing up the owl noticeably more. The sun however wasn't as vibrant as it was in the DC, so I used a simple orange coloured circular overlay which was feathered to suit and used it over the suns' changing position across the three wide/medium shots. Also burned in a little vibrancy with it's layer filter – Just to get a pop out of the dull fogginess that the FC grading had given it. It's worth noting that some grainy shot's still remain from the DC to retain it's colour and tone. Most remain in fact, but the updated FX shots and the very worse frames with noise got switched if the DC colour tone could be closely approximated. All spinner shots showing wire have been replaced with masked off FC footage patched into the DC shots and regraded to suit, using Premier's quick correction filter, 3 way correction filter or Dr Dre's colour match software. Generally wider shots where the camera is locked off or doesn't vary much in it coverage, where it's exposure and target content is consistent, tend to work well with DR Dre's colour match software. But for longer lenses where any given subject is isolated from the overall environment's colour palette with busy elements moving in and out of shot, then the general colour grading filters are required. This takes longer than using Dr Dre's, but is still more accurate overall. *Update – The previous procedure with Dr Dre's software still rings true in principle, but when I created a contact sheet of 64 frames loosely covering the overall scope of the film with a focus on the gamut of colour schemes featured. Dr dre's software can then create a .cube file, which can then be used with Adobe After Effects' colour LUT function to grade the whole damn thing. It is less accurate than using it with small sample sizes, but surprisingly accurate considering 64 frames are able to closely approximate the general tone for large sweeping sample sizes. It even sometimes reccovers the original detail in highlights that the final cut had put a tint over to “fog” the burn out. In places it is close to the archive tones and in others it is certainly in keeping with the archive tone versus the FC, which is nice for those cleaned up FX shots - Certainly those shots from the FC that represent the time of day better than certain archive shots. And some shots still simply need manual colour grades to finish it off as even Dr Dre's Colour matching can't always cover drastic level changes which can result in heavy digital artifacting and pixel break up. When Pris arrives at Sebastian's building, the 2 shots used are from the FC & graded to match the DC in tone, but not luminosity. In effect it's a blend of the two - brighter than the strangely subdued FC, so more reminiscent of the original, but the original was heavy handed. *This has now been replaced with colour matched grading using Dr Dre's software. There is no unicorn daydream when Deckard is sat at the piano, solo finger tapping in his melancholia. What is used visually is from the International Cut (IC) and the audio is from the Work Print (WP) –The original on-set notes Ford was playing are appropriate and atmospheric, adding to the diegetic warmth of the apartment hum. There is no other score used here - The nostalgic love theme is not needed yet. The piano notes actually start a few seconds too early to round off the previous scene - timed as a tender nod to Sebastian having found a friend I assume, but here Ford's playing works much better for the same reason, so I let it come in just a little earlier and louder. The window shot of Abdul Ben Hassan was from the FC & graded to match the DC *This has now been replaced with colour matched grading using Dr Dre's software which I then scale matched the footage from the FC & graded to match the DC, but also cropped the additional FC footage to a small inset area to focus only on the FC changes. The preceding FC crane shot from Animoid Row is not used here. It used a quick fade-in fade-out piece of score which was more awkward than the original cut which always felt timely and smooth enough for me. Besides the FC footage of animoid row and Deckard outside Abdul's looks terrible in the FC - Dark and muddy. At Taffey Lewis's, the crane shot street scene and shot of Deckard and the Policeman are from the FC and graded to suit the DC before cutting to the the interior shot from the DC. The street scene is an awkward restoration considering the hideous FC grading uses greens that obliterate the RGB dynamic and the WP is all there for reference. So it has been built up layer by layer with various colour tweaks, noise patterns, opacity filters and isolated coloured masks to imitate the WP colour range as closely as possible whilst adding a little punch to deal with the print fog – including overlaying the WP itself to pull out the highlight dynamics. The hockey mask dancers are just straight from the WP as it just pops nicely and is a good example of fairly untarnished footage from the WP. 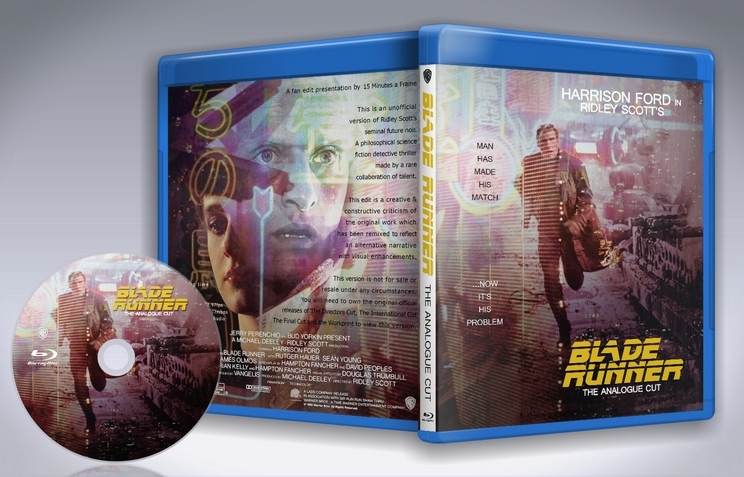 The audio from the WP is used here as my preferred diegetic music, starting from the street bustle, Deckard's club entry and continuing to the original audio cue as Deckard's vidphon chat with Rachael ends. This portion is essentially a tightened up restoration of the WP edit, as the diegetic music heard outside Taffy's bar (Qu'ran by Brian Eno and David Byrne with session music by Jon Hassell) was replaced by a Vangelis piece in all other cuts for the clubs' interior except in the WP. Keeping the original diegetic music from one scene to the next (exterior to interior) works very nicely when the surround sound amplifies in an instant, the segue to the first interior shot – making for a somewhat more invisible cut than other releases. It's also worth noting that this music would probably have remained in the theatrical cut had it not been a tune that gained criticism from the religious community at the time for it's use of sampled quotes from a holy book. I've read that the complaints were not accurate but I have no desire to verify this. Ultimately if the WP can be viewed with it, so can this edit. This diegetic music in Taffy's bar scene wasn't very well mixed in the WP so I remixed 5 of the 6 channels - leaving the low frequency as it is for now. I used the original music track to fill out the surround channels predominantly, with a little more in the left & right to augment what was already there and a touch more in the center for continuity. The old tracks were a good guide but the inferred diegetic audio dropped off to nothing in the surround tracks and was pretty shaky all-round with almost a wow & flutter effect. It is now much more present and consistent without totally taking over the bustling wild track. When it cuts to the vidphon around the corner from the main club area, I left more of the music track in the Left surround than the Right surround to embellish the orientation of the wider room etc. To match up the WP audio with DC footage it meant there were a few frames missing from the slightly tighter edits of the conversation with Taffy in the DC that had developed from the original WP editing. I lengthened the shot of the photo of Zhora using Twixtor Pro - Whilst trimming a frame at the end to remove a slight backward thumb movement to bring less attention to the edit. This filled a third of the void and cutting the remainder of the music down to suit the rest of the DC edit didn't throw the audio continuity out too noticeably as there was already an unavoidable jump cut interrupting the track during the original WP audio when Taffy's voice was coolly ending the conversation - At which point it is conveniently the loudest his voice was in the mix. For the 3 shots replacing Joanna Cassidy's stunt double I scale matched the footage from the FC & graded to match the DC, but also cropped the additional FC footage to a small inset area to focus only on the FC changes - allowing as much of the original neon tube lighting from the DC to show through as possible. The original primary colours of the neon tubes are nearly impossible to replicate satisfactorily using the FC footage whilst retaining the skin tones and ambient light elsewhere. Dr Dre's software did it nicely too, but the contrast wasn't as good so I went with the fast colour grader in Premier. The shots at the liquor stall and the road side chat to Bryant where Deckard's cheek scuff is repaired in the FC. I graded all the cheek repairs from the FC to suit the DC and then I cropped and isolated them each to let as much of the original DC frames show through as the liquor stall blue lighting looks very muted in the FC. Also the colour spectrum in the FC is such that when you get rid of that green darkness you are left with weak blacks that fall to pieces, so there are limitations to how closely you can match the archive tones when using the FC footage in spite of some very powerful software available these days. Deckard's eyes. The footage of Deckard over Rachael's shoulder in the bathroom doorway is from the DC. Then I used After Effect's motion tracking of the blurred pixels of Deckard's retinas. This wasn't very accurate so then it was frame by frame node nudging in order to map out and mask the reflections. “...I want more life...fucker” Using “father” is painfully obvious and remedial symbolism and undermines Battys' demeanour entirely. Tyrell's head crushing scene is mostly DC – The expression's on Hauer's face were to me far more telling and moving than the blood and gore. Also the inclusion of Tyrell's owl bearing witness to it's maker's demise at the hands of it's own manufactured brethren was aesthetically cerebral. I did include a timely run of blood and briefly featured the eye sockets when Batty was done but it never needed more than a sprinkle – both are from the FC & graded to match the DC. The 2 latter shot's of the spinner querying Deckard's ground traffic activity uses footage from the FC & graded using Dr Dre's software to match the DC and then overlayed over the DC whilst being closely trimmed around the spinner and also masking it's wires. The shot of Deckard arriving outside Sebastian's building is from the FC & graded to match the DC in the same fashion as the previous shots featuring Pris' arrival. *This has now been replaced with colour matched grading using Dr Dre's software. The IC version of Pris' death scene has the fingers in nose shot and the extra footage of a 3rd gunshot to kill Pris. I kept the fingered nostrils, but with a 2 gunshot scenario - using the footage of Deckard's expression from his second gunshot in the IC in place of the footage of his expression from the IC's 3rd gunshot which is used for the final shot in all cuts. The expression from the 2nd gunshot is more of a grim distortion – A distaste for the task at hand and showing a little of his desperation setting in. More...human if you will. Not that the replaced expression wasn't similar, but this one was more apparent, and crossed with Pris's horrific screaming in animal terror just felt more acute. Where Deckard climbs through the floor and sits on the bath on his own and Batty is shown driving a nail through his hand, also on his own - is the same room and edited to appear to be at the same time as though in matching but separate rooms. They fight in this room briefly just afterwards. I have re-edited the sequence to reflect the chronological order of the shot list as filmed. The original shot order was obviously Batty having tracked Deckard to the bathroom, they fought (Batty let Deckard hit him with stylish bravado) and after Deckard exited, Batty found a nail to put through his hand to induce a desperate resurrection of nerve response as his body starts to shut down. This mean't losing a few frames to join some shots of Deckard together earlier in the bathroom in a more natural way. Others had to be chopped up - like dividing a long shot of Deckard on the ledge into 2 to correspond with return cuts to Batty using the nail, which I augmented with an added blanket flash of lightning on Deckard just as it cuts to Batty with the sound of thunder. Cutting the next long shot on the ledge around the corner into 2 allowed me to retain Batty's exclamation “YESSS” and by the interleaving of re-used audio for rain sounds and the external South East Asian slow chanting, the whole sequence has been re-shuffled to suit the chronology of the use of the same room. The back of Roy Batty's hand simply looks too fake in the IC and FC when the nail comes through and it looks too distorted – like soft rubber as it's being held and squashed with his other hand. So that's gone too, but I kept the extra camera angle on his facial expression as he collects himself, cutting short his frenzied breath after the initial burst of pain signals feeling. All shots of Deckard climbing and hanging from the building are re-cut from the DC to suit the FC sequencing. The external matte painting composite shots are from the FC and graded to suit the DC except for where they have used the same shot twice of the corner of the building. 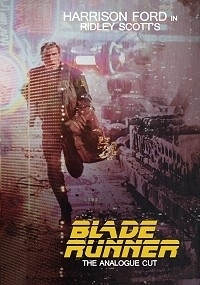 In the first instance we see it is oriented to show the left side in the DC which makes more narrative sense than in the FC where they show the right side orientation – As it then goes on to show the reversal of the frame after Deckard has traversed the corner, thus seeming to be the right side. In the first instance of the corner shot, I have replaced the shot entirely. Making use of the surrounding detail in the classic shot of Deckard dangling – as seen from above. I have taken a still and illustrated and animated a reversed angle view to suggest it is what he sees as he steps out onto the ledge. I painted out Deckard and replaced him with girders and details etc and turned it around by about 180 degrees. I distorted the gap using photoshop to make it appear a little further away etc and then added a falling piece of wood to be consistent with the slats he kicks out. This was done by animating a tumbling 3d texture mapped rectangle panel using Blender, which was then layered into premiere via an alpha channel .png sequence. Then I added a few layers of stock steam footage to incrementally envelop the falling wood as it falls, creating a perception of depth. On top of this there is also a forced perspective overlay of rainfall with some wet pitter-patter on the opposing girder using stock footage samples. Added a 3 frame lightning flash which freezes and helps embed many details nicely for a split second. In the 2nd corner shot where Deckard climbs round to the right side and meets Batty kicking out the window slats, I took the footage of Batty in the window from the matte shot in the FC and re-composited it into the DC footage to better match the grading of the original footage. The FC version of this shot also has awkwardly painted shadows in the top right. I have instead introduced some lighting FX in the top right of the DC's wide shot to mimic the background when the close up on Hauer leaning out of the window shows the part of the set swinging and dripping with flashes of distant neon etc. I also added a slight green/blue cast to simulate the slight foreground light on Deckard and his corner of the building. Over all of this I simulated a few blue flashes of lightning over the whole frame to match the lightning featured in the close-ups either side of this shot for colour continuity as a whole. I also augmented the rising steam in the matte shots with an extra layer or two of smoke footage, which when tinted bluish, fitted in just like steam. Most of the remaining shots were from the DC except for the matte FX shots looking down at Deckard clinging on for life above the street which I regraded far closer to the DC, using elements from both the DC and FC in composite. Other regraded FC shots were Deckard standing on the roof for the first time, Batty sitting, Battys' tears in rain dialogue – Which is adjusted visually to grow lighter more slowly towards dawn. The dove's flight into the new skyline is also obviously from the FC graded to suit the DC. The credits are from the FC with it's necessary technical and staff info updates, but with the Warner Brothers logo from the DC. Added a stereo track option as an alternative to the surround track. Also added a third track featuring Ford's voice over for those who like it. It is stereo and it involved using the final phrases from the TC car scene, but placed over the hallway scene at the end. Had to cut it down a little and re-order it to make it work. It's a little obtrusive, but I wanted to give the V.O. option, and I definitely didn't want to include the original ending. Had a great time with this one. The editor clearly had a vision for what they wanted and the end result did not disappoint. The new color timing helps the visuals immensely, there were hardly any noticeable cuts, all the pieces are here for a instant classic in the world of fanediting. I also appreciate the choice to release an alternate audio track with the narration, if only as an added bonus to an already brilliant edit.